On July 12, the Sisters of St. Benedict of Our Lady of Grace Monastery in Beech Grove, along with family members and friends, witnessed the first monastic profession of Sister Susan Elizabeth Rakers. Sister Susan Elizabeth is one of five children born to Vernon and Barbara Rakers. She is originally from Belleville, Ill.
She received her bachelor’s degree in computer science from Southern Illinois University in 1989, and later received her master’s degree in management from Lake Forest Graduate School of Management in Lake Forest, Ill. Prior to her entrance to the community, Sister Susan Elizabeth was employed by United Health Group. She was a member of Holy Spirit Parish at Geist in Fishers, Ind., in the Lafayette Diocese, where she was an active volunteer in the youth ministry program. She also volunteered at the Lord’s Pantry and Anna’s House in Indianapolis. 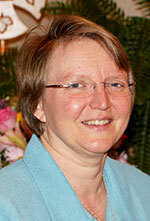 Presently, Sister Susan Elizabeth works in the Development Office at the monastery.